Tragedy in Texas: Sure, everyone knows Nolan Ryan was a stud on the mound and an all-around badass everywhere else. But few ever heard about the government standoff he was involved in during the 1990 season. 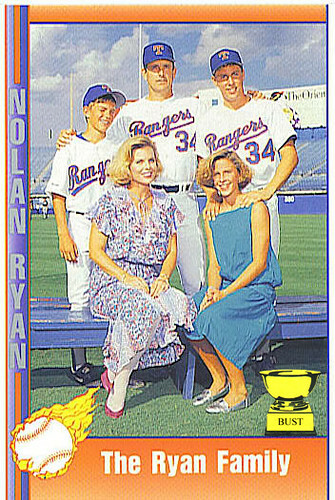 The Bureau of Alcohol, Tobacco and Firearms received word that Ryan had started a cult, luring in young boys who wore replica Rangers uniforms and young women in baggy dresses and off-center haircuts. The feds swooped in, surrounding Arlington Stadium and urging the fireballer to release his followers. Ryan ignored their requests, instead sending out a pallet of Rangers road unis, all No. 34. A three-day impasse ensued, ending when ATF agents stormed the stadium, tackling anyone in cleats. Ryan and his believers had escaped, however, and the government ended up only pressing charges against Julio Franco, who was caught having inappropriate relations with his bat.